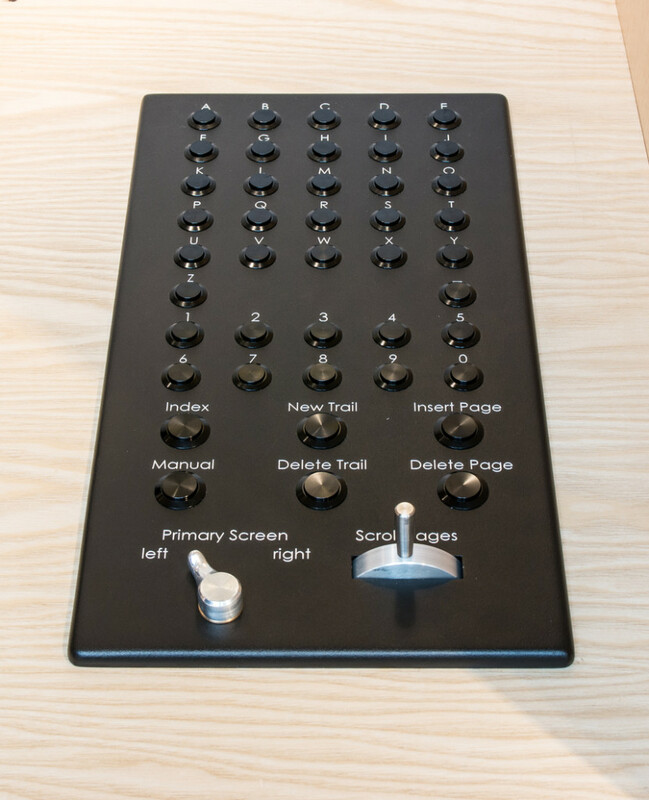 The MEMEX is a historical vision of an american scientist, published in 1945, but never realized. 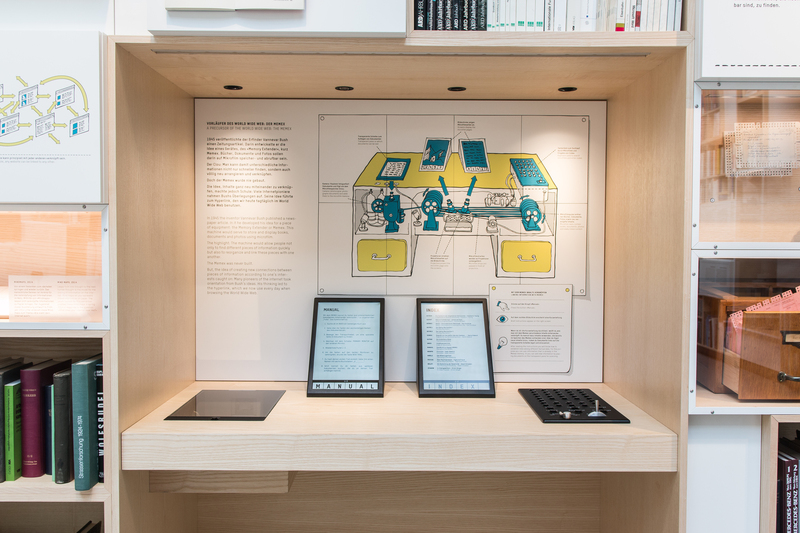 It is a „device for individual use, which is a sort of mechanized private file and library“ based on microfilm technology. The most important idea is the creation of “trails”: links between pages – the first hyperlinks. 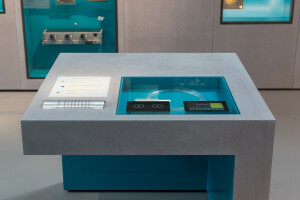 This interpretation of the MEMEX vision is based on digital components. 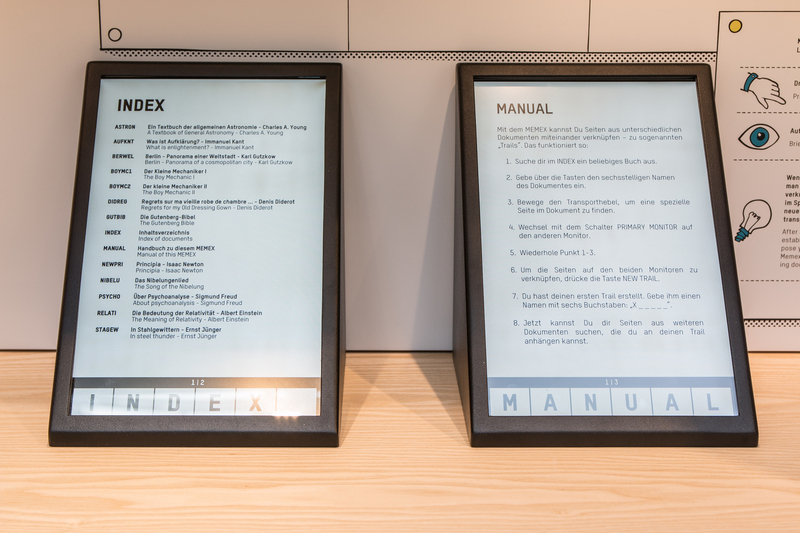 The user can search the library, browse documents and create trails in a way that is very close to the original idea. The user interface is very simple but powerful. My talk on the basic MEMEX idea and this exhibit at the Vintage Computing Festival Berlin 2015 can be watched here (in german language). 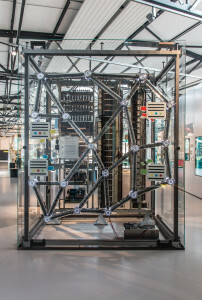 This device shows a network of 18 nodes and 27 edges that form a model of the internet. Messages can be send betweeen 4 terminals. These messages are split into data packets that are reassembled at the receiving terminal. The routing of the packets depends on the different base speed of the connections and the current network load. Nodes (routers) can be disabled to simulate network outages. 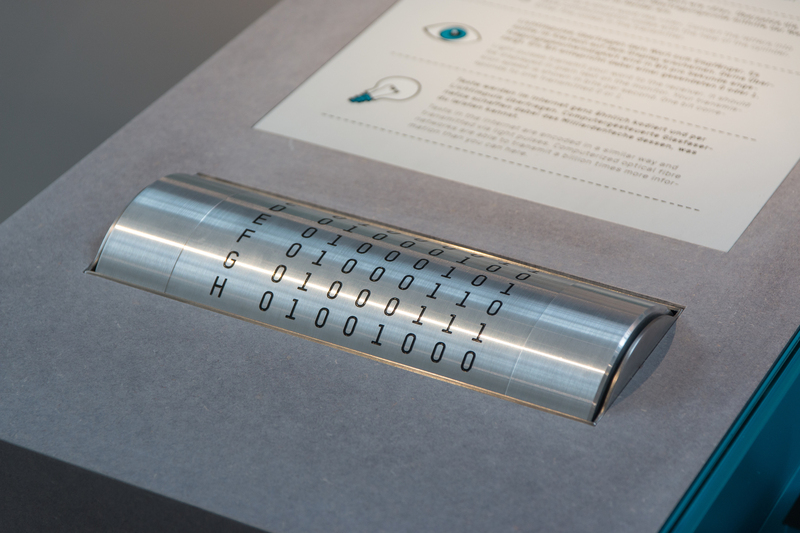 The data flow is visualized using flip-dots (mechanical bistable display elements). A high load on the network can be experienced as a real motion with an acoustical effect. The whole exhibit is covered under a glass panel, all 30 buttons are touch-sensitive capacitive elements. 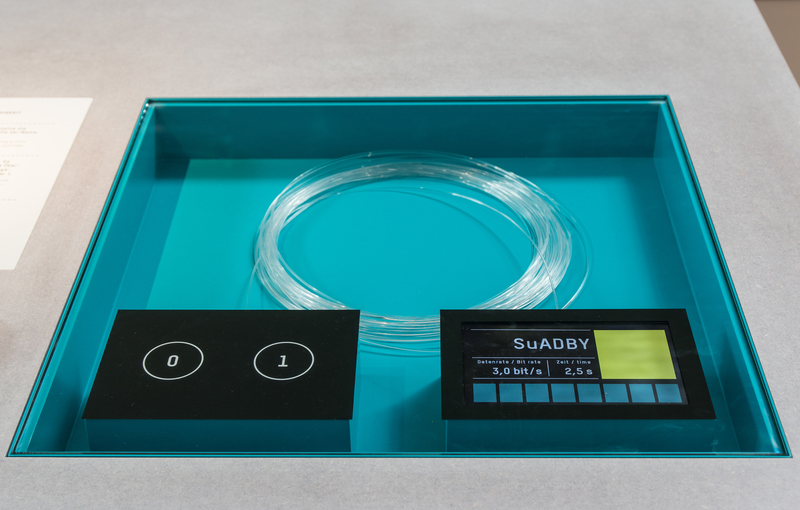 This device demonstrates data transmission over fiber optical cables. 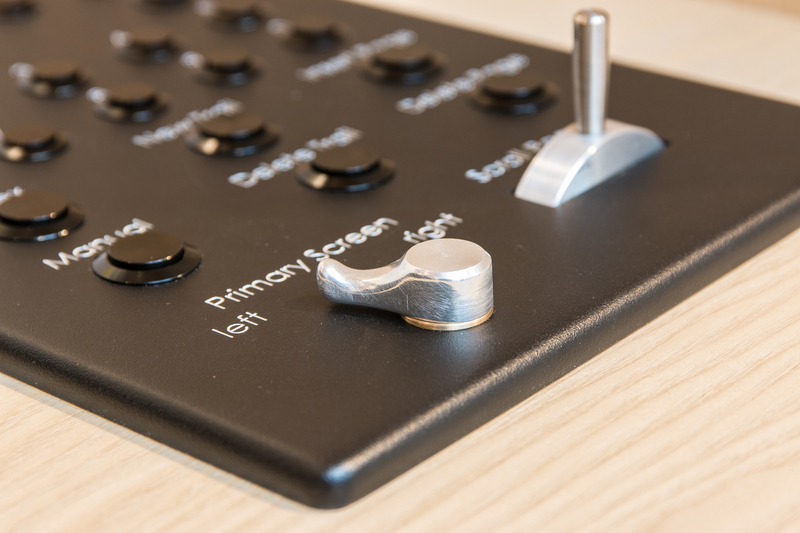 The sender unit emits light impulses when one of the buttons (0 or 1) is pressed. By sending eight bits a character is transmitted (ASCII code). A receiver unit shows the bits, the received characters and the data rate. The way of the light can be observed at the entrance and exit of the optical cable. The ASCII-code of all capital letters can be selected from a cylindrical table. 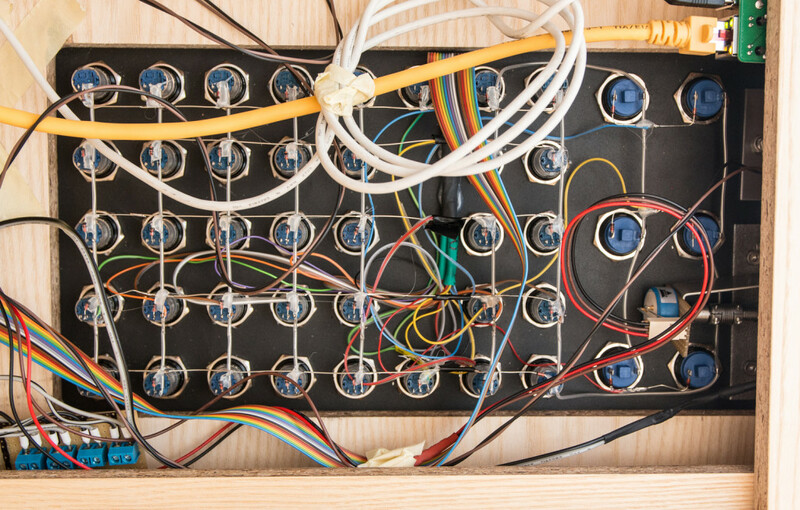 We plan to use more than 1000 dots that are connected with different RS485 bus segments and controlled by a bunch of PSoC 4 microcontrollers. 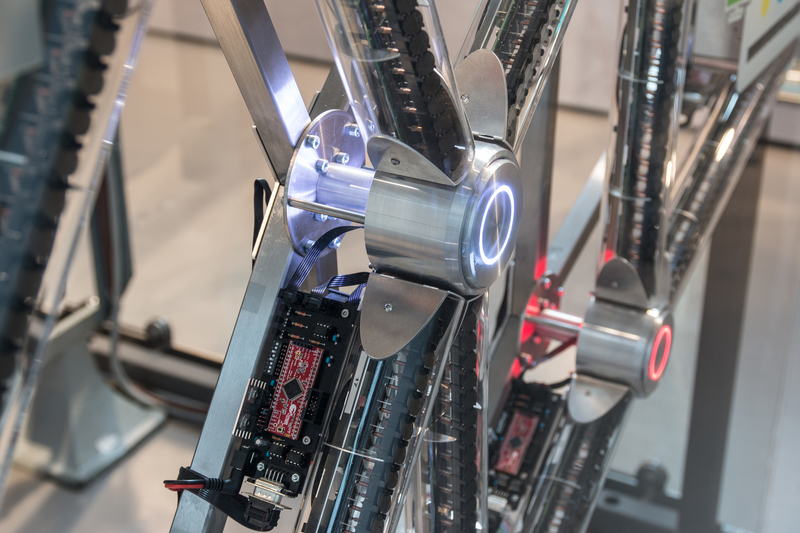 Capacitive sensors will be used for user input and a lot of RGB LEDs provide visual output. The whole scene will be controlled by a python application using the networkx modules. Pictures will be posted here soon. 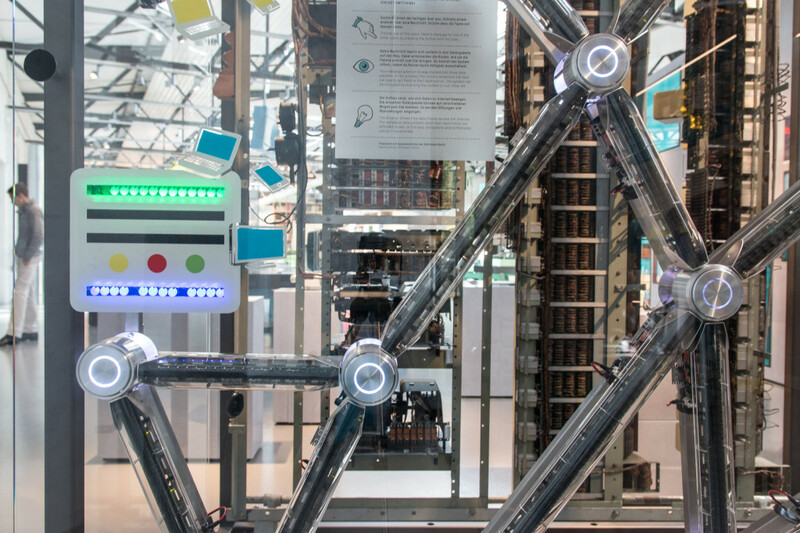 My first larger project using the Arduino platform is an exhibit for the German Museum of Technology in Berlin. It will be shown in the Konrad Zuse exhibition. The device shows a random number (left display). By activating the correct bits in a binary representation (center display) the visitor has to assemble this number (right display). From a programmers point of view this is really not a big deal, but for most people this can be a challenge. 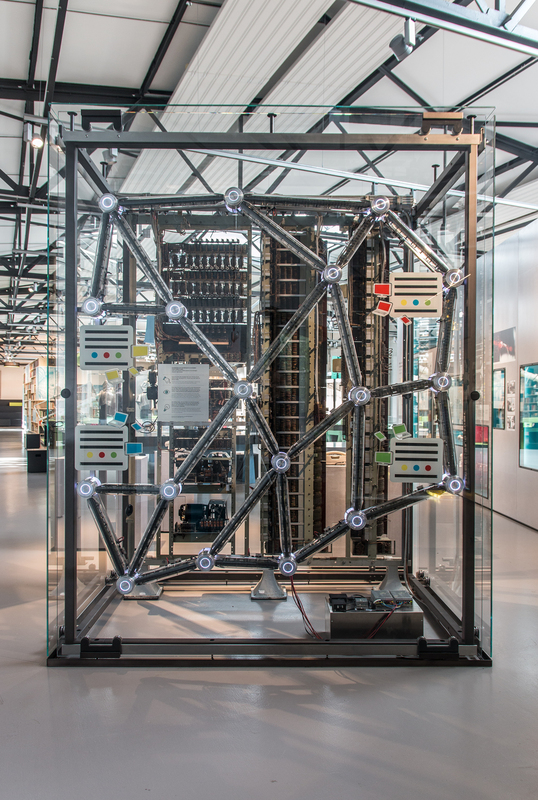 This device was created in cooperation with Felix Scharstein who has a long experience in objects and machines for museums. 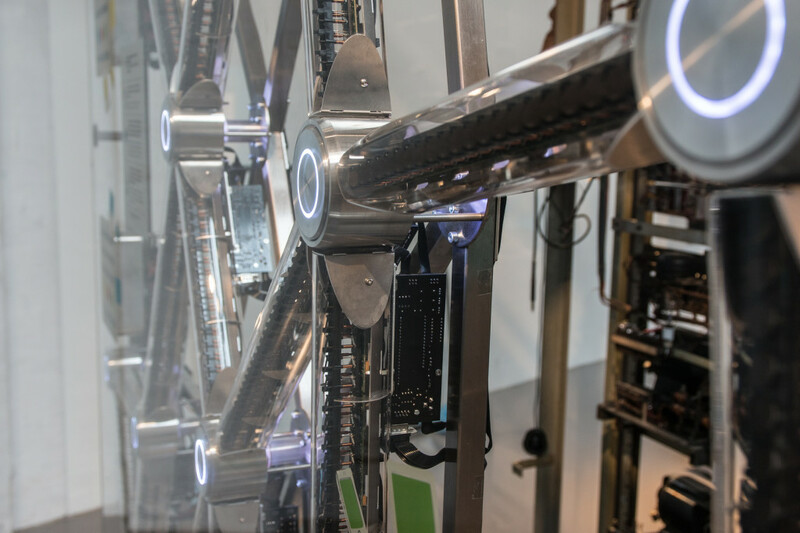 An article on a more mechanical device for the same exhibition will follow soon. 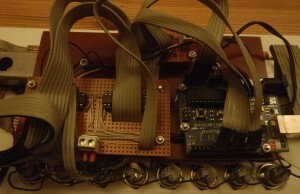 The device is controlled by an Arduino Duemilanove. All buttons are connected to digital inputs: eight buttons for the digits, two buttons to increase (+1) or decrease (-1) the number and one button to request a new random number. 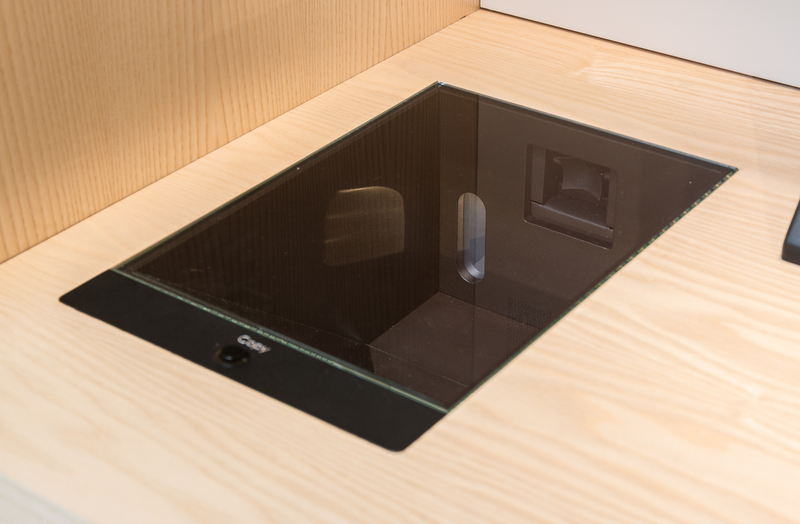 The front panel was made from white Corian. 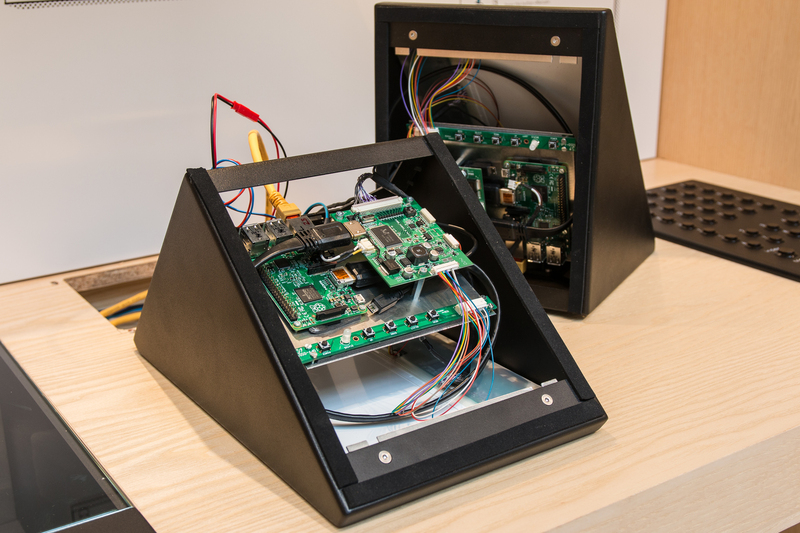 The displays consist of 14 single 7-Seg-modules (Kingbright SA10-21GWA) connected to two MAX7221 controllers. One controller drives the center display, the other drives the left and right display. 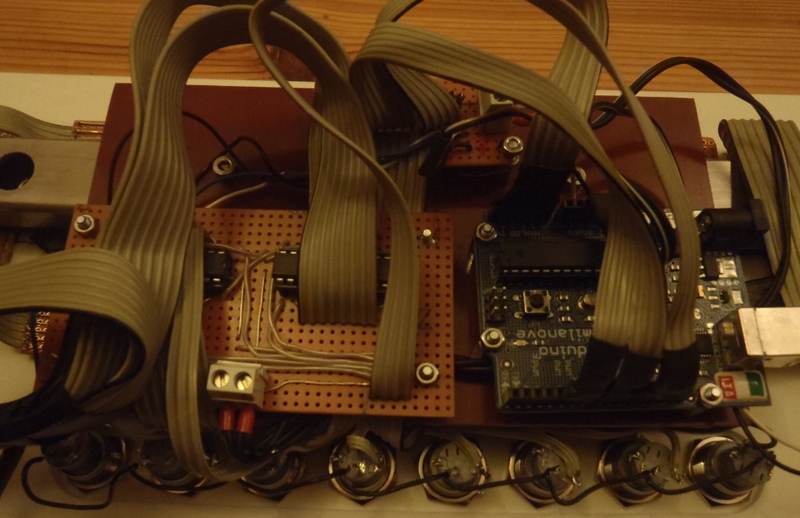 The controllers are cascaded and connected to the Arduino using a serial interface (3 pins). The Arduino library LedControl is used to control the displays from the software. By using this excellent library the main program can be kept really small and simple (~150 lines). The program logic is trivial, no special programming skills were required. All wiring was done by hand (~800 soldered joints). This was a hard job, but finally everything is working. The device will be installed in the museum in the next weeks. Many thanks to the creators and contributors of Arduino and LedControl!